Happy New Year to all. We hope you had a great Christmas and had loads of time to get out on the bank fishing. 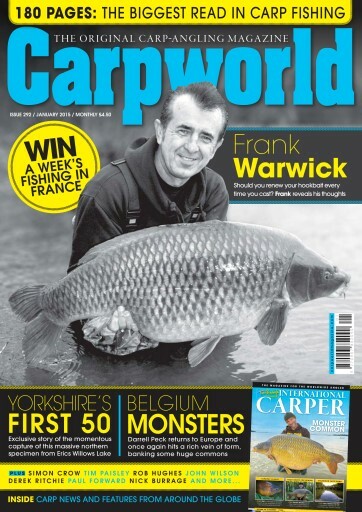 The January issue is packed with must-read features including some thought-provoking stuff from Frank Warwick on how often you should change your hookbaits. We also have the exclusive story of Yorkshire’s first 50lb carp, and Darrell Peck goes to Belgium in search of his own monsters. 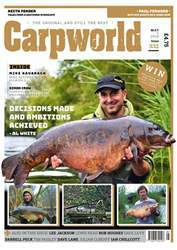 Plus we have Simon Crow, Tim Paisley, Rob Hughes, John Wilson, Derek Ritchie, Paul Forward, Nick Burrage, and many more, so can you afford to miss the biggest read in carp fishing?